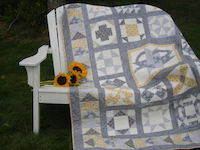 The Piecemakers Guild was formed by a group of women after taking classes from Sally Palmer Fields, a quilt teacher from Chelmsford, MA. The original purpose of the Piecemakers was to continue learning about quilting. They started this Guild in hopes of continuing their journey. They have been successful. Guild membership is now at 125 members with a wait list. 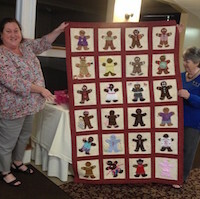 The purpose of the Tewksbury Piecemakers is to provide the opportunity for the education, appreciation, and advancement of the art of quilting, service and fellowship. Guild meetings are held once a month, September through June. Meetings are scheduled on the second Tuesday of the month at the Tewksbury Senior Center at 7PM. Our year generally starts with a “get acquainted” meeting in September. We have two or more guest speakers throughout the year, as well as, workshops, fabric swaps, monthly raffles, mystery rides, mystery quilts, a Christmas party, a yard sale and a wonderful quilt show (currently running every other year). We work on charity projects donated to local organizations or needy families. Board/Officer meetings are held once a month to review the treasury report and to set the agenda for the next meetings. All guild members are welcome to attend. Annual dues are currently $25.00 per year, payable by June for the following year. Each member receives a copy of the monthly newsletter, membership list and first options on workshops and activities. Non-member guests are invited to attend meeting for a fee of $5.00 per meeting.